In the above article we saw the coolest Orthodontist office on the planet. Here is an update. showing striping guru, Ron Myers striped everything in sight..
Ron got into town about 9:30 and jumped right in. 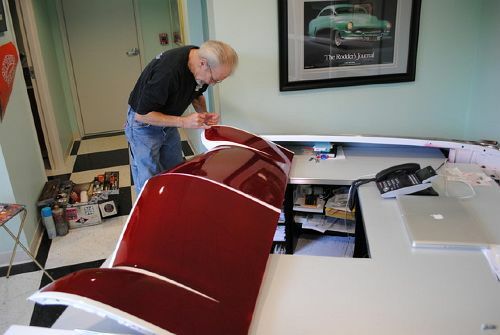 First order of business was to stripe the scallops on the Larry Watson 59 Caddy desk. Near as we could determine from pictures, Larry outlined the candy raspberry over pearl white with lavender, so that is what Ron did. Looks great .